Did you know I take at least 10 minutes to read a menu to decide what to get when I eat out at a restaurant? Well, for the exception of fast food joints like In-N-Out. I`m completely serious. Even when I`ve been a gazillion times before, I still stare at the menu. I bet my waiters/waiteresses hate me. I`m one of those people they check up on like three times because I`m always like: "Sorry!! Just a few more minutes!" Thankfully (or is it? ), I`m always much too full from my meal to order dessert. Because, seriously? That would take me even longer to decide. It`s a good thing I make desserts at home all the time!! This always gives me a wonderful excuse to eat desserts for breakfast, lunch, dinner, desserts, and snacks in between. Hehe. Madeleine cookies are so pretty and elegant-looking. I always adore seeing them in the bakery windows. I`m not sure why I don`t see them around the blogosphere as much. They`re incredible simple to make, just like muffins. I`m assuming it`s because many are afraid they`ll stick to the pan or their madeleines will not have the classic dome shape. No need to worry. I`ve made madeleines many times before and they all turned out beautiful. The trick it to let the batter chill in the fridge for a few hours, or overnight. The leavening agent, such as the baking powder in this recipe, will mix and mingle with the wet ingredients to help produce that classic dome shape. I prefer to scoop the batter onto a well greased/floured pan and then cover it with plastic wrap before placing it in the fridge to chill. Normally, recipes instruct you to plastic wrap the batter and scoop into pan when you`re ready to bake. I`ve tried both ways and I much prefer the former method. It`s less messier and much simpler to just preheat oven and stick the pan in the oven the next day. 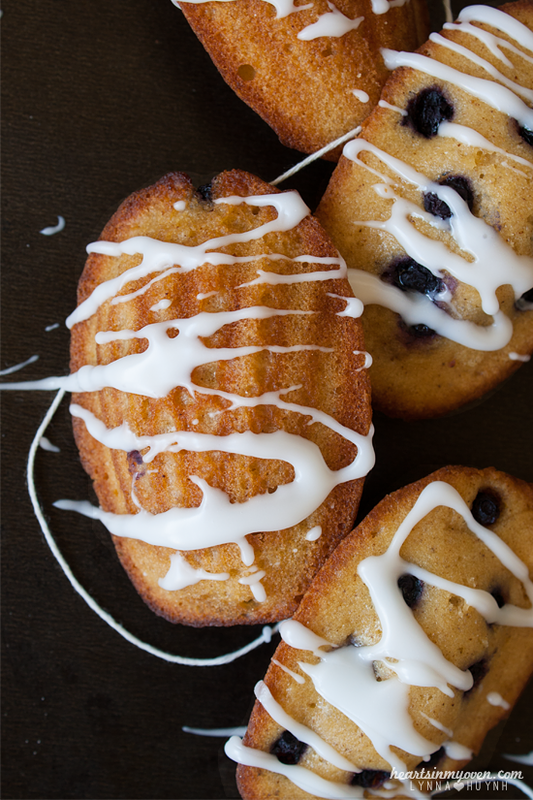 I use a nonstick metal madeleine mold and never had issues with them being stuck. I use cooking spray, too. If you go the butter and flour method, I`ve read that it helps to chill the mold after, so the butter hardens before you scoop the batter onto it. 1. 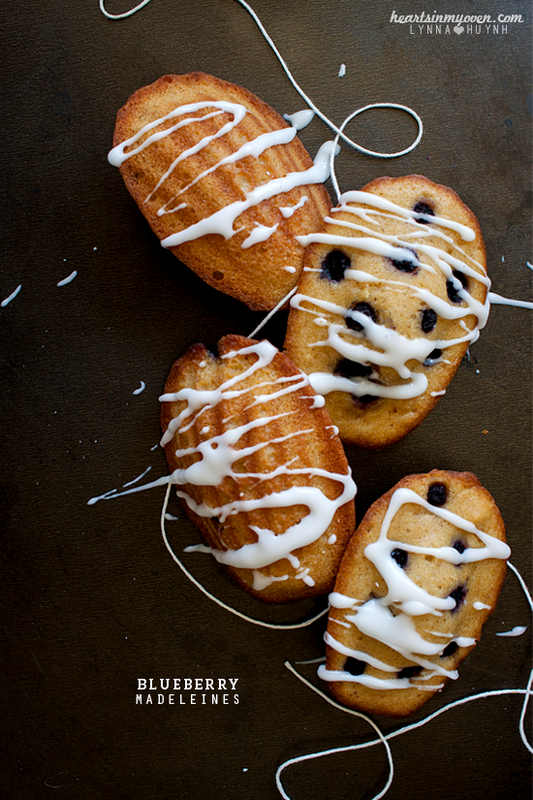 Grease your madeleine molds: with cooking spray or butter and dusted with flour. Set aside. 3. In a small bowl, whisk flour, baking powder, and salt. Set aside. 4. In bowl with electric mixer, beat eggs and sugar (medium-high speed) until thick and pale (about 5-8 minutes). 5. Beat in vanilla extract. 7. Fold about ½ cup of flour mixture into warm butter. 8. Then fold everything back into the batter. 9. Using a cookie scoop, scoop batter onto prepared pan. 10. Spray a sheet of plastic film with oil and cover madeleines. 11. Refrigerate for at least 1 hour, or 3 hours to overnight. 12. When ready to bake, remove madeleines from fridge. Preheat oven to 375°F. 13. Press frozen wild blueberries into batter. 14. Bake for 6-9 minutes. If edges are browning too quickly, reduce temperature to 350°F. 15. Combine powdered sugar and lemon juice together. Add more powdered sugar if you want it to be thicker. 16. 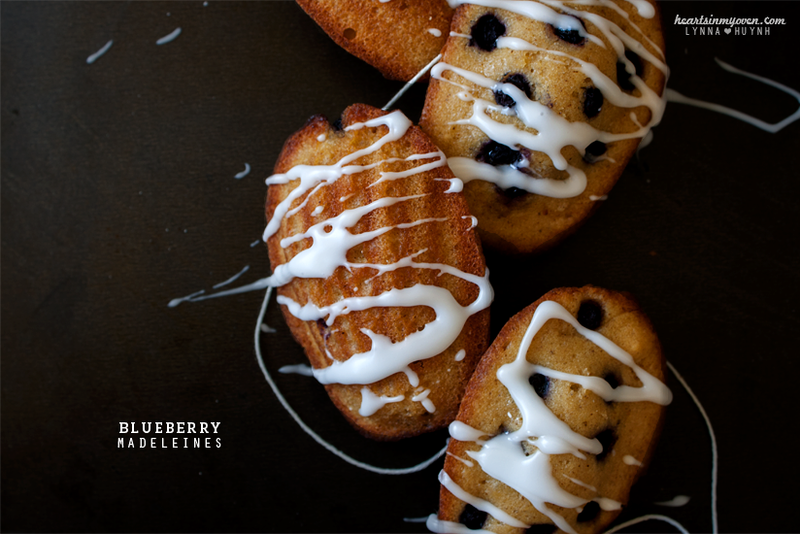 Drizzle over cooled madeleines. - After 6 minutes, I reduced the temperature to 350°F and baked for an extra 2-3 minutes. I used frozen wild blueberries because they are smaller and have less liquid. Add them to the batter frozen so blueberries will not bleed into batter.